Extraditing dissident Islamist cleric Fethullah Gulen to Turkey would be a betrayal of American values and should be permanently off the table. President Trump says that handing over Gulen to Turkey is not under consideration "at this point." That's not good enough. NBC News reported on Nov. 15 that administration officials were considering Turkey's request to extradite Gulen, who has lived in Pennsylvania since 1998. It cited two senior U.S. officials who said that the Justice Department and FBI were asked to reopen Turkey's extradition case against Gulen in October. Inquiries were made about his immigration status. This consideration reportedly aimed to placate Turkey by handing over Gulen in exchange for taking diplomatic heat off of Saudi Arabia in the wake of the killing of Washington Post columnist Jamal Khashoggi. Since the murder, Turkey has orchestrated a campaign of slow leaks and disclosures designed to keep the story in the news and to expose Saudi lies about what happened. The two leaders reportedly met privately for nearly an hour Saturday during the G20 summit. It isn't known whether the Gulen issue was discussed. Turkish officials previously requested Gulen's extradition after a 2016 attempted coup, which Turkish President Recep Tayyip Erdogan baselessly blames on Gulen. He has gone from being an Erdogan ally to being his scapegoat. Turkey calls Gulen's followers the "Fethullah Terrorist Organization" and accuses them of trying to build a parallel state by allegedly infiltrating state institutions, particularly the military, police and judiciary. Freedom of thought and speech have vanished in Turkey. People even have been imprisoned for appearing in a documentary about Gulen. Turkish authorities accuse dissenters of being Gulenists regardless of whether they belong to the movement, dissidents told The Investigative Project on Terrorism (IPT). Erdogan bragged in April that Turkish operatives had kidnapped 80 Gulenists and brought them back to Turkey. He also vowed to nab Gulen. "You, who are in Pennsylvania, will also come," Erdogan said of Gulen. More than 82,000 people have been arrested since the failed coup, and more than 200,000 have been detained. Another 6,000 academics have been fired, 319 journalists have been arrested and 189 independent media outlets have been shut down, according to TurkeyPurge.com. Independent media critical of the Erdogan regime no longer exists. Gulen would face an uncertain fate if he were to be extradited. Amnesty International noted in January that Turkish prisoners face torture and beatings, and Erdogan would most certainly want to make an example of his rival. And if Turkey restores the death penalty for accused terrorists – which is how Erdogan describes Gulen, handing him over could become a death sentence. Extraditing Gulen would send a message that America no longer is a "beacon" of freedom and that President Trump is weak, Turkish dissidents purged by the Erdogan regime tell the IPT. Abdullah Bozkurt, former editor of Today's Zaman, one of Turkey's largest newspapers before Turkish authorities shut it down in 2016, underscored his belief that handing over Gulen would be a sign of weakness. President Reagan's support for Soviet dissidents offers "a sharp contrast to what Trump is rumored to be contemplating. I thought Trump read Erdogan better than what Obama did which was an appeasement," said Bozkurt, who was purged by Erdogan in 2016. "It signals a weakness which Erdogan smells and wants to exploit for his own benefit." 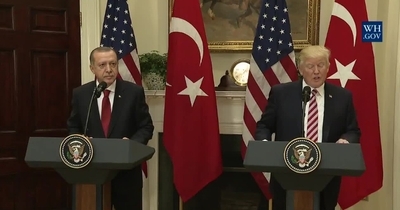 Bozkurt contrasts Trump's approach to Gulen with the president's approach to formerly imprisoned American Evangelical Pastor Andrew Brunson. In Brunson's case, Trump imposed economic sanctions on Turkey to force it to let him go. In Gulen's case, Bozkurt sees the administration vacillating and is less committed to the cause of human rights. Extraditing Gulen would be a "point of no return" for America's international reputation because it would send the message that other Turkish dissidents cannot rely on American principles, said Ahmet Yayla, a former Turkish National Police counterterrorism official purged by Erdogan in 2015. Like Erdogan, Gulen is an Islamist, but his ideology poses less of a threat to the U.S. and the West than Erdogan's totalitarianism and pro-terrorist policies. In contrast with other Islamists, for example, Gulen views the issue of women's headscarves as a matter of personal choice. He also worries about Erdogan's Turkey "providing haven to violent radicals and pushing its Kurdish citizens into desperation, would be a nightmare for Middle East security." Turkish government officials ordered police not to intercept ISIS and al-Qaida fighters crossing into Syria, Yayla said. "It would be a mistake to regard the AKP and al-Qaida as enemies." Hacked emails leaked in 2016 disclosed that a company belonging to Erdogan's son-in-law, Turkish Finance Minister Berat Albayrak, profited from the illicit sale of ISIS oil. Turkey's intelligence agency, the MIT, provided assistance to ISIS and al-Qaida in Syria, according to Kurdish sources. Charities linked to both terrorist groups operate openly in Turkey according to Bozkurt's Stockholm Center for Freedom. Erdogan publicly says that Hamas is not a terrorist group. "It is a resistance movement that defends the Palestinian homeland against an occupying power," Erdogan wrote on his official Twitter account in May. Hamas leader Salah Arouri, listed as a specially designated terrorist by the U.S., operated from Turkish soil for several years until 2015. Hamas military representatives still work in Turkey. Israel's Shin Bet found that Turkey also funds and helps equip Hamas using corporate intermediaries like SADAT International Defense Consulting, founded and chaired by key Erdogan adviser Brig. Gen. Adnan Tanriverdi. Instead of looking to violate U.S. human rights principles by potentially handing over Gulen, President Trump must take a hard line against Turkey's rogue-state activities.